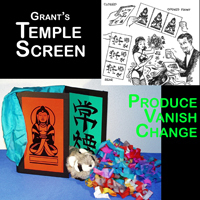 Mak Magic's original Temple Screen is the Best in the Business! Show a 3-Fold hinged screen front and back. You form the Screen into a Triangle, stand it on the table and pull out solid objects. Massive amount of Silks and other objects can be produced. Each Panel has a Double layer of Tyvek tape. Mak Magic's updated version has a built in Permanent Load Chamber.